Home / Alkaline Info / Dr. Daryl’s Top 10 Cooking and Eating Tips to GET OFF YOUR ACID! Dr. Daryl’s Top 10 Cooking and Eating Tips to GET OFF YOUR ACID! When your body is acidic, it is not a healthy body. The problem with the Standard American Diet, aka SAD diet, is that it is pumping people up with damaging acids and toxins every single day that are robbing you of your health and your energy! Most Americans are combating this lack of energy with caffeine, coffee, sugar and energy drinks, and they are using more acidic foods and drinks to get more energy and it doesn’t work! In fact, more people pay more attention to the pH of their soil in their garden or the water in their pool! You see, your body is no different – it too needs to keep the pH of its blood and tissues tightly regulated. You can empty the water out of your pool and start over, but you can’t buy another body! When your body is acidic, it becomes prone to disease, illness, weight gain, chronic inflammation, fatigue, digestive problems, reflux, skin issues, sleeping problems, and the list goes on. When you GET OFF YOUR ACID, it is a total game changer in regard to your health and your vitality. You feel more energized, your inflammation goes away as does the painful joints and muscles associated with that, you sleep better, your skin glows, and the fat literally melts off your body! So let’s do this thing, starting with tip number 1! Adding just one or two raw alkaline foods into your diet every day will make a huge difference for your health without feeling like sacrifice or deprivation. To start, try to eat one alkalizing food every single day, and then later you can add on as you go. Remember, it’s moderation not deprivation. 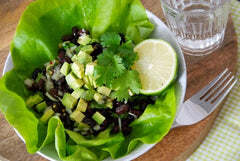 High up on the list of great alkaline foods to eat are salads. They are a quick and easy way to add a ton of alkalizing foods into your diet that go with just about any type of cuisine. Not only do salads have a lot of vitamins and minerals, but the organic greens also have lots of water, which is great for helping to alkalize your body. Salads can be super healthy and so versatile, and help you get the most nutritional bang for your buck. Try using as many different colors of vegetables as possible. Make what my wife and I call a ‘rainbow salad’ by adding a colorful assortment of organic vegetables like cucumbers, red bell peppers, cilantro, celery, sprouts, jalapeno, avocado, and some unbleached fresh mineral sea salt (my favorites are Celtic grey sea salt, Himalayan, and Redmond Real Salt). To make salad more accessible to your everyday routine, prepare it as soon as you get home from the grocery store. When you get the organic greens home, wash them, dry them with a spinner, and then store them in an airtight container with little oxygen. This way, anytime that you want to add extra greens to your meal, all you have to do is grab a handful. Note: avoid ALL vinegar except apple cider vinegar being that they are very high in yeast and sugars. Instead, use lemons, extra virgin olive oil, and sea salt. Adding some flax oil to salads, veggies, and even chicken and fish (if you eat animal proteins) supplements your diet with alkalizing nutrients high in plant-based Omega 3 and 6 Fatty Acids which is essential for your body health and energy. Salad dressings are especially easy to make with flax oil since you can just add lemon juice, garlic and spices to a couple of tablespoons of flax oil to make a delicious and inexpensive salad dressing. Make a cup or two of this dressing and store it in an airtight container in the fridge. This way, whenever you want a salad, you have a healthy salad dressing on hand without having to do any extra prep. Simple, convenient, and healthy is what this is all about. Both meat and dairy have an acidifying effects on the body, and massively congest and clog your digestive system. The digestive system is so crucial because 80% of your immune system lives there, and that is where so many diseases stem from in the body. So these are foods to gradually start to eliminate from your diet. You can start by just cutting portion sizes, or the amount of times you have meat and dairy per week. 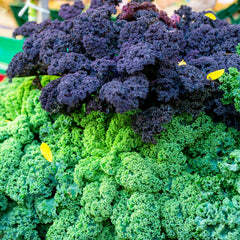 The way I look at it is, make alkalizing foods the main event of the meal, and acidic foods the sideshow. Eventually, if you want to get rid of them all together, you can transition away from them by eating Alaskan Salmon, or replace them all together with vegetarian options like non-GMO tofu and almond, coconut, or hemp milk. This is SO IMPORTANT! As a general rule of thumb, most grocery stores are set up with the fresh ingredients on the exterior and the junk in the middle. Try to stay on the perimeter of the grocery store as much as possible and only journey to the center when you absolutely need to pick out necessary ingredients. Avoid aisles with things like alcohol and snacks, because those can always tempt us with impulse buys. There are fats that KILL, and fats that HEAL! There’s a lot of confusion about fat in our diet, but the truth is that our bodies can’t function without it. There are fats that give you energy, and fats that DRAIN your energy. If you want to be healthy, lose weight, get rid of chronic inflammation, and have optimal energy, it’s important that you get the recommended amount of healthy fats daily. These are otherwise known as Omega 3-6-9 Fatty Acids, of which, Omega 3 and 6 are essential, which means your body requires them to be healthy but doesn’t actually make them. Omega 3 Fatty Acid: Fish oil, chia seeds, hemp seeds, flax seeds. Omega 6 Oils: Hemp, sesame, flax, sunflower, and safflower. Omega 9 Oils: Found in olive, almond, avocado, and macadamia oils. Medium Chain Triglycerides (MCT): one of my favorites, coconut oil, which I add to just about every smoothie, my chia puddings, and yes, it even works as a fantastic skin and body moisturizer. When you cook your veggies for too long or on too high of a heat, you reduce the nutritional content of the vegetables. In addition, by cooking vegetables too long you can transform alkaline foods into acidic ones, so while you have good intent, it is actually doing more harm than good. Try eating raw and lightly steamed vegetables as often as possible rather than cooking them until most of their nutritional value is eliminated. To maintain the vegetables ‘raw’ status, it must be cooked under 118 degrees Fahrenheit. To keep it raw, do what I call a ‘flash steam or sauté’ where you steam or sauté the vegetables for no more than 4 minutes. You can always use a dehydrator as well, and ALWAYS cook with coconut oil, not olive oil. Coconut oil has the highest of smoke points of all the oils. This means it can hold a high heat for a long time without the oil going rancid and turning into a trans-fatty acid, like most other oils do. Green Jolly Ranchers don’t count! Eating foods that are naturally green on a daily basis can make a tremendous difference without you having to think beyond the color of a food - it doesn’t get much simpler than that! Either add them into the main dish that you are cooking, eat them raw, or prepare them as a side. Another simple way to add them in is by using them as a topping for sandwiches. Get creative with this one and have fun! Spinach is my favorite because it is so versatile! It is easy to steam it, blend it, juice it, toss it in a salad, and put it on a sandwich. 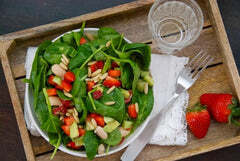 We especially like anything involving cooking spinach since it wilts down to virtually nothing. This means you can add it to pretty much any dish while barely, if at all, impacting the flavor of the dish. In a way, this is sort of a sneak attack for getting more veggies into your family’s diet! Sugar is evil. End of story. It is also something that we eat entirely too much of in general. 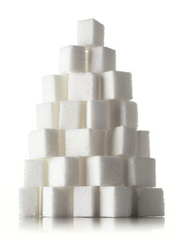 The average American eats 170 pounds of sugar a year! SUGAR = ACID = GLUE! Sugar basically makes our blood this thick substance, so that it moves through the body sluggishly leaving us drained of all energy. It feeds microforms like candida and yeast, fungus, mold, and cancer in your body. You want to heal your body, starve these cells from the food they love the most and get the most energy from – sugar! I suffered from a powerful addiction to sugar for most of my life, and I know how hard these cravings are to overcome. Research shows sugar is 100 times more addictive than cocaine! But here’s the deal, when you crave sugar, your body is really craving magnesium. It is a sign that you are deficient in alkaline minerals, and as you start to add these minerals into your daily diet, your cravings and addictions will begin to go away – just as mine did. That way, you avoid the trap of swapping sugar with artificial sweeteners. Aspartame is one of the worst neurotoxins you can put in your body, and other sweeteners are close behind. They throw off the body’s pH levels while wreaking havoc on the body. Try substituting in natural sweeteners like organic stevia, monk fruit, or coconut sugar. I hear it all the time… Fruit is okay because it’s a ‘natural sugar’. Don’t believe this myth!!! All fruits have fructose in them that have acidifying effects. To your body, sugar is sugar is sugar. If it’s a fruit that has a moderate amount of sugar, stick to one serving of that fruit a day, preferably in season. I'm not saying don't consume any fruits with a higher sugar content. In fact, many of the smoothies in the 7-Day Alkaline Cleanse have fruits like bananas and berries. They make the smoothie taste better and they do possess some health benefits. So you can eat or use ingredients like bananas, but you MUST make sure to have it with a healthy fat such as coconut oil, chia seeds, raw almond butter, hemp seeds or flax. Healthy fats will slow down the metabolic process of the sugars in the fruit and will neutralize the ACID and prevent an insulin spike in your blood. So do you have a new food or two to start incorporating into your diet after reading these 10 tips? Any foods you are going to do without now? Remember to think replace rather than eliminate. Check out my blog on SWAP THIS FOR THAT – A NEW FOOD CHART. Don’t forget that the Get Off Your Acid 7-Day Cleanse is a great place to start because it makes it easy to replace the more acid-forming foods you eat now with alkaline foods your body will thank you for! If you have done my 7=Day Alkaline Cleanse, you’ve experienced some of my amazing, nutritious alkaline meals that literally taste so good you’ll feel like you’re cheating. As a Certified Raw Food Chef, every season I change the recipes so that you can take advantage of what’s in season. Even if you don’t do the full on cleanse, there are so many ideas and tips in the digital cleanse materials that you receive that you can start using on a day-to-day basis that will make a difference in your life and your health. With over 100 Delicious Alkaline Recipes, you’ll know exactly what to do to make healthy taste good!